Fly into Dibrugarh and transfer to Guijan near Dibru Soikhowa National Park and Biosphere Reserve. DS National Park is one of the 19 (nineteen) biodiversity hotspots in the world. Fly into Dibrugarh and transfer to Guijan near Dibru Soikhowa National Park and Biosphere Reserve. DS National Park is one of the 19 (nineteen) biodiversity hotspots in the world. It mainly consists of semi wet evergreen forests, tropical moist deciduous forest, bamboo, cane brakes and grasslands. Situated in the flood plains of Brahmaputra, at an altitude of 118 m above sea level, Dibru-Saikhowa is a safe haven for many extremely rare and endangered species of wildlife, including over 300 species of avifauna both endangered and migratory, as well as various species of shrubs, herbs and rare medicinal plants. Though the park was primarily meant for the conservation of White winged wood duck in its natural habitat, it is also the famous for its bright colored wild horses known as Feral Horses. Some rare and endangered animals of this sanctuary are Hoolock gibbon, capped langur, slow loris, water buffalo, tiger, elephant, gangetic river dolphin etc. Bird life consists of Spot billed pelican, White bellied heron, Pallah’s fishing eagle, Pale capped pigeon, Swamp francolin etc. and migratory birds like Geyleg goose, Brahmini duck, Bar-headed goose, pelican, Black stork etc. Check in at Padmini Resort. Time permitting, a short birding around Maguri Beel wetland. Overnight at Padmini Resort. Full day exploration of the park by manually-oared country made boat, motorized boat and on foot. Overnight at Padmini Resort. Morning proceed to Gibbon Wildlife Sanctuary near Jorhat(about 3 hours drive). Notified as the Hoolungapar Reserve Forest in 1881, this isolated forest patch of 21 sq km was reconstituted as the Gibbon Sanctuary for the protection of India’s only ape, the Hoolock Gibbon. Hedged in between tea estates and the Moriyani railway line, Gibbon Wildlife Sanctuary is home to as many as seven primate species. Besides the park’s signature species, Gibbon Sanctuary is a good place to spot the resident Pig-Tailed Macaque and Stump-tailed Macaque, besides Assamese Macaque, Rhesus Macaque and Capped Langur. Careful inspection of the trees may reveal the Malayan Giant Squirrel and the nocturnal Slow Loris. Leisurely nature walks are the best way to explore the park, which teems with birds. Some of the notable species are the Lesser Adjutant Stork, Wedge tailed and Pompadour Green Pigeon, Red headed Trogon, Ashy Wood Pigeon, Great Hornbill, Brown Hawk Owl, Bay Woodpecker, Speckled Piculet, Streaked Spiderhunter, Indian Scimitar Babbler, Scarlet backed Flowerpecker, Slaty Blue Flycatcher, Puff throated Babbler and Striated Grassbird. Time permitting. afternoon a short visit to the park. Overnight at Gibbon Resort. Morning birding and primate watching in Gibbon WLS. After early lunch Proceed to Kaziranga Tiger Reserve. 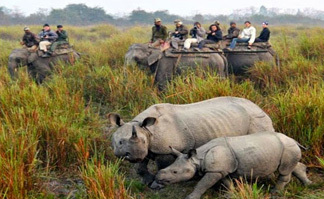 Aptly called as the ‘Serengeti of India’, Kaziranga is a UNESCO World Heritage Site. Its alluvial Savanna grasslands, tropical and mixed deciduous forests are safe haven to a myriad wildlife including the all members of India’s BIG FIVE CLUB(Bengal Tiger, Swamp Deer, One Horned Rhino, Wild Asiatic Water Buffalo, Asiatic Elephant). The park boasts of the unique distinction of being the only protected area in the world having highest density and number of the endangered One Horned Rhinos and Bengal Tiger. Situated on the South bank of Brahmaputra river, the park consists of an area close to 1000 square km. Check in at Diphlu River Lodge or Iora Retreat. Overnight. Game drives by private Gypsys, Elephant back safari, birding hike in Buraphar range, boat ride on Brahmaputra to look out for the endangered Ganjetic Dolphins. Stay at Diphlu River Lodge or Iora Retreat. After breakfast transfer to Guwahati airport.